Work rounds 8, 10, 12 with contrasting color. Round 7: Ch 2, dc in each dc around. Join with slipstitch in top of first dc. Round 8: Join contrasting color with a slipstitch in join, ch 3, 2 dc in same st. *Skip 2 dc, 3 dc in next st. Repeat from * around. Join with slipstitch in top of ch 3. Fasten off. Round 9: Join main color with slipstitch in any space between 3 dc groups, ch 3, 2 dc in same space. *Skip 3 dc, 3 dc in next space. Repeat from * around. Join with a slipstitch in top of ch 3. Fasten off. Round 10: Join contrasting color with slipstitch in any space between 3 dc groups, ch 3, 2 dc in same space. *Skip 3 dc, 3 dc in next space. Repeat from * around. Join with a slipstitch in top of ch 3. Fasten off. Round 11: Join main color with slipstitch in any space between 3 dc groups, ch 3, 2 dc in same space. *Skip 3 dc, 3 dc in next space. Repeat from * around. Join with a slipstitch in top of ch 3. Fasten off. Round 12: Join contrasting color with slipstitch in any space between 3 dc groups, ch 3, 2 dc in same space. *Skip 3 dc, 3 dc in next space. Repeat from * around. Join with a slipstitch in top of ch 3. Fasten off. Work remainder of hat in main color. Round 13: Join main color with a slipstitch in top of any dc, ch 1, sc in each dc around. Join with a slipstitch in top of first sc. Round 14-16: Ch 1, sc in each st around. Join with a slipstitch in top of first sc. Round 17: Ch 1, rvsc (reverse single crochet) around. DO NOT join, but fasten off and use your yarn needle to join and weave in end. I just made this hat over the weekend. It was so much fun to make, and it looks so nice! I know what everybody is getting for Christmas this year :-). I have made your mitts in the past and love your designs. I live in Whistler and I very much want to learn how to make a simple hat. I love the granny hat but I can not understand a bit of the directions...is there a Knitting or Crocheting for Dummies? for beginners to make their first hat? Having never knitted or crocheted..is there a beginners guide to making my first hat...I love the granny hat! There are books and CDs to teach yourself as well. Or find out about taking lessons at a yarn shop. Often classes are free if you buy your supplies from them. Good luck with learning a new skill in 2009. Thank you so much. Your directions are so easy and complete I made mine with "Vanna's Choice" yarn, a green solid and green variegated and it turned out really cute. My sister loves it so I think I will need to make her one two. Suzie, I had a great time making this pattern. I also made the matching scarf with a slight variation. The set is done in RH dark orchid and plum pudding. Would love a coordinating mitts pattern. Thanks. That's a great idea. I will have to think about how to do that. Thank you for the pattern. I like making hats but you did not give a gauge for it. I tried making this one for myself but it came out too big. Have to rip it out and start over. Measure around the head, above the ears. I made this hat in 3 hours today. It turned out beautiful. Thanks for the pattern. I googled reverse single crochet and learned a new stitch too! Good for you learning a new skill. Hi there! I am having trouble. I can whip up the kids version of this hat in no time, but I just can't seem to get the adult one right!! It keeps flattening out and not taking shape. I have counted, and recounted my stitches and they all are the right number. Any suggestions!?! I am desperate!! Thanks, Leanne H.
If your count is right it shouldn't flatten out. The child's pattern is the same as the adult's only a few more increases before starting the "granny" part of the cap. love it! 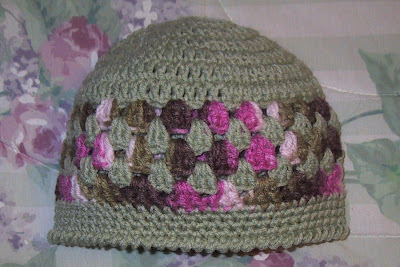 pattern is easy to read and the hat is cute and simple. All the rounds are worked on the same side, no turns. I don't know how your reverse sc could be on the wrong side. I suppose you could ch and turn before working the rvsc. I am like Leanne H.
I am having trouble when I am making this hat. I keep counting and recounting and still flattens out and not taking shape. I know you said if the count is right it will work. So I to do not know what I am doing wrong here. It looks like a big pancake...HELP!!! After the increase rounds it should take the cap shape. Perhaps you are crochting to loosely. Would love to make some of your patterns, but I have no clue how to get them printed off the computer!!!! Can you help me? You need to paste them into your choice of document programs and print from there. I think it is a while since you posted this pattern. I have just found it and I love it. It makes up very quickly and I had no problem with the hat taking shape. Also I was able to print by just printing off the entire page via the File/print facility at the top of my page in Safari. Thank you Suzie for sharing. I look forward to making up some of your other patterns. My grandmother used to make me a similar kind of hat when I was a kid. She is also the one who taught me how to crochet. Unfortunately, she passed on before she could teach me how to do the hat. I promise not to share online. But, I will be making several for myself. I love color, so my hats have to coordinate with my outfits. figure out why you don't join at end. By using your tapestry needle to join you have a smoother join. Nearly impossible to see. Much nice finish than if you join with a slip stitch. Is this American stitches, or British? Any time you see sc (single crochet) in a pattern you can tell it is US terms. this pattern is amazing, perfect for beginners! I am a intermediate at crocheting and this is perfect for teaching my sister to crochet. It pleases me that you found the pattern good for teaching your sister. After you complete the cap, when you cut the yarn leave a tail 3 or 4 inches long and use a tapestry needle to weave the tail in stitches to hide it and keep the cap from unraveling. I belong to a Crochet group at Valley Baptist church and we plan to make hats for Cancer patients whir taking chemo treatments. I plan to make your Woman's Granny Hat and give it to the cancer center to give to their patients. Thank you for sharing this pattern.